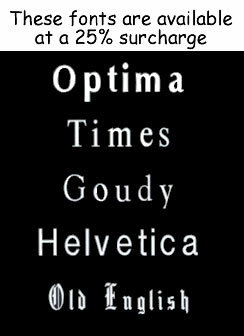 Depending on the product chosen, you have multiple choices for fonts. With our SNAPI Color Tags, your choices are virtually limitless. Our font selection encompasses nearly three thousand different basic font choices and many variations, we can likely provide exactly what you're looking for. If you're considering an engraved product, some of your choices are shown below. Because of the nature of engraving, a font that you've fallen in love with on your computer may look (in our professional opinion!) absolutely awful when on an engraved product. This is particularly true on engraved brass where a blackened letter looks differently than a printed one. 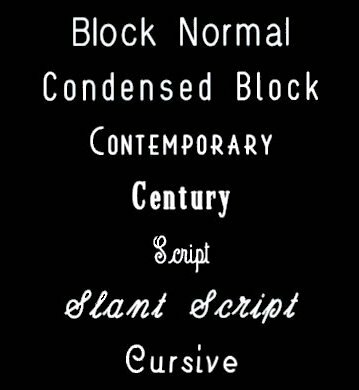 If you have a special favorite font, ask us how we think it will look and we'll give you our honest assessment. The above are samples only. Let us know if you have something particular in mind.